Tired of mulching bare spots in the shade garden? 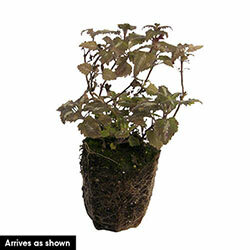 Lamium covers up that dirt and adds colorful flowers, foliage and texture. 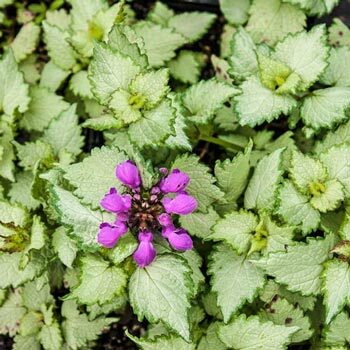 This easy-care, mat-forming ground cover provides pops of purple blooms from mid spring to early summer. But what really makes this tough perennial a standout is its vivid foliage that ranges from chartreuse to silvery white to many shades of green. Lamium grows well in shaded to partially shaded to shaded areas, making it perfect for planting along the edges of woodland gardens or as a transition from one shade garden area to the next. When planted with spring-blooming bulbs, its colorful leaves hide fading bulb foliage. Lamium maculatum. Foliage Type: Broad, oval, silver-white leaves with greenish edges. Flower Form: Clusters of 'snapdragon-like' flowers along the top 1/2 of the short sturdy stems. Planting Instructions: Dig a hole large enough to spread out the roots without bending them. Soil Requirements: Prefers well-drained moist soil, but will grow in drier conditions. Pruning: Remove spent blooms to keep the plant tidy. After flowering. Winter Care: Hardy. No special requirements. Additional Information: Prefers moist, well-drained shaded areas, but also does well in drier spots. In drier areas, its habit may open up a bit and get a little leggy, and not stay as dense and compact.